PASS Summit is the largest conference for technical professionals who leverage the Microsoft Data Platform. The 20th summit, which took place in Seattle last week, played host to a number of Azure-related announcements. Rohan Kumar, Corporate Vice President, Azure Data, gave the Day 1 keynote at PASS Summit v.20. In this post, he provides an overview of his keynote, including how hybrid connects all your data and enables comprehensive AI and analytics. Microsoft’s consistent data platform across on-premises and cloud connects all your data and makes intelligence over all your data possible. John Macintyre shares an overview of what's new SQL Data Warehouse features, including enhanced workload management, row-level security, best-in-class development tools and insights, and advancements that make Azure a great platform for all analytics. Announces the general availability of Row-Level Security (RLS) for Microsoft Azure SQL Data Warehouse, an additional capability for managing security for sensitive data. 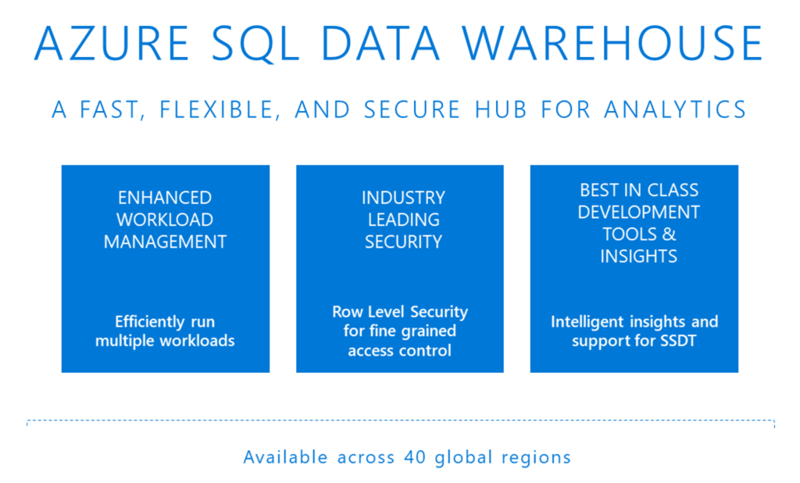 Azure SQL Data Warehouse is a fast, flexible, and secure cloud data warehouse tuned for running complex queries fast and across petabytes of data. It is available now in all Azure regions at no additional charge. SQL Server Data Tools (SSDT) is now in preview (registration required). With SSDT, database project support enables a first-class enterprise-grade development experience for modern data warehouses. 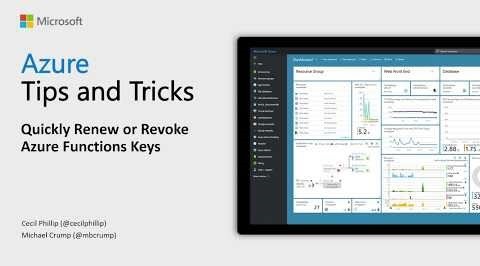 Check data warehouse scripts into source control and leverage Microsoft Azure DevOps within Visual Studio. Apply and deploy changes using features such as schema compare and publish, all within a single tool. Announces the public preview release of Static Data Masking, which is a data protection feature that helps organizations create a sanitized copy of their databases where all sensitive information has been altered in a way that makes the copy sharable with non-production users. Static Data Masking, which ships with SQL Server Management Studio 18.0, can be used for a variety of uses cases, including development and testing. Machine Learning Services with support for R is now available for public preview (registration required) on Azure SQL Database. This preview functionality is initially available in a limited number of regions in US, Asia Europe, and Australia with additional regions being added later. During the preview, Machine Learning Services with R is not supported for production usage. Python language support will be added in a future update. Azure SQL Data Warehouse provides a built-in holistic management experience by having a tight integration with Azure Advisor and Azure Monitor. These two services are immediately configured by default for SQL Data Warehouse to automatically deliver you workload insights at no additional cost. You no longer must leave the data warehouse overview blade to access Azure Monitor metrics when monitoring usage, or validating and applying data warehouse recommendations. There are additional advanced performance recommendations through Azure Advisor, including: adaptive cache, table distribution, and Tempdb. Azure SQL Data Warehouse now enables enhanced insights into analytical workloads by integrating directly with Microsoft Azure Monitor diagnostic logs. This new capability enables developers to analyze workload behavior over an extended time period and make informed decisions on query optimization or capacity management. Azure Monitor diagnostic logs is an external logging process, which provides additional insights into your data warehouse workload. This post simply highlights three PASS Summit sessions for learning more about Azure SQL Database and migrating your SQL Server databases without changing your apps, as well as the choice of OSS databases delivered as a fully managed service. Bing Local Business Search API on Cognitive Services is now available in public preview. Bing Local Business Search API enables users to easily find local business information within your applications, given an area of interest. The public preview of Bing Local Business Search API enables scenarios such as calling, navigation, and mapping using contact details, latitude/longitude, and other entity metadata. Private endpoints for HDInsight clusters deployed in a virtual network are now generally available. This feature enables enterprises to better isolate access to their HDInsight clusters from the public internet and enhance their security at the networking layer. HDInsight is available in 27 public regions and Azure Government Clouds in the United States and Germany. Azure Event Hubs for Apache Kafka is now generally available. With Azure Event Hubs for Apache Kafka, you get the best of both worlds—the ecosystem and tools of Kafka, along with Azure’s security and global scale. Event Hubs for Kafka also enables you to unlock the capabilities of the Kafka ecosystem more easily. In October, the Azure portal team started posting monthly updates to help you discover everything that is new in the portal. This month, they introduced a new way for you to switch between different Azure accounts without having to log-off and log-in again, or working with multiple browser tabs. We’ve also made enhancements to the way you find what you need in the Azure Marketplace, to the management experience for Site Recovery, Access Control, and database services. Quickstart Templates rarely go beyond “playground” systems or proof-of-concepts; they are too rigid and offer too little flexibility to map real-life business and technical requirements. The SAP on Microsoft Azure Engineering team broke down SAP deployments in Azure to the most granular level to offer “building blocks” for a truly customizable, yet easy-to-use experience. We recently published the test findings from running TPC-E profile test workloads on premium storage configuration options. We continued this testing by including Ultra SSD, which is the new storage offering available on Microsoft Azure for mission-critical workloads with sub-millisecond latencies at high throughput. This post summarizes the details and our findings. Spoiler alert - a typical SQL Server will gain significant throughput on Ultra SSD compared to Premium Storage driven by the latency differences. The November release of Azure Data Studio (formerly known as SQL Operations Studio) is now available. Azure Data Studio is a new cross-platform desktop environment for data professionals using the family of on-premises and cloud data platforms on Windows, MacOS, and Linux. In this release, the emphasis was on fixing customer issues and adding and improving existing extensions. We can't believe it's already been 100 episodes. We are having so much fun putting the IoT Show together, we hope you are enjoying it as much. Thanks for watching! In this episode we are exploring how quick and easy it is to create a chatbot that can answer top-of-mind questions for employees or customers. Leveraging QnA Maker we will build a bot in minutes from a FAQ website and even add some personality to our bot. 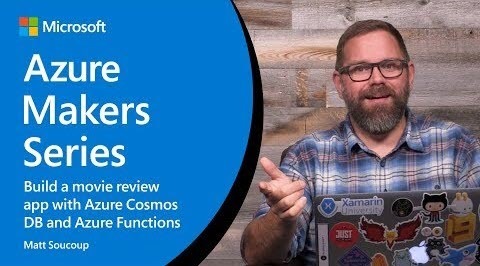 Learn how to mash three free Azure services together – Azure Cosmos DB, Azure Functions, and Azure AD B2C – and create a movie review app using Xamarin.Forms! Give your logged-in users premium reviews, access to exclusive content, and more. There are various metrics available for you in Microsoft Azure Database for MySQL to get insights on the behavior of the server. You can also set alerts on these metrics using the Azure portal or Azure CLI. This post provides some example best practices on how you can use monitoring data on your MySQL server, and areas you can consider improving based on these various metrics. The same info is available for Azure Database for MySQL monitoring, too. This post discusses some recent instances where attacks against a sophisticated hybrid Linux honeypot service (a decoy system to lure cyber attackers) originated from IPs within customer machines. In each case, malicious behavior on those compromised customer VMs had already resulted in alerts being raised through Azure Security Center. Analysis of these attacks yielded greater insight into the attacker’s behavior. This fed further detection development, allowing us to surface more attack behavior to customers earlier, and provide a more complete view of the attack end to end. Microsoft has several physical infrastructure and operational controls in place to help protect the Azure platform, and we have over 3,500 cybersecurity experts at Microsoft to help protect, detect, and respond at any time to security threats against our infrastructure and services. An organization that implements a hybrid cloud strategy will need a consistent DevOps model across both an on-premises and public cloud. Microsoft Azure Stack extends Azure cloud services and capabilities to the on-premises environment, which is why it is so valuable for DevOps. Azure Stack and Azure give you the ability to stand up a hybrid continuous integration/continuous development (CI/CD) pipeline to land and move workloads on either an on-premises or public cloud. The concept of smart buildings is generating lots of excitement, but what does the transformation to intelligent cities look like at ground level for those in charge of making it happen? This post is the first in a series of three illustrating how Internet of Things technology can change urban areas for the better—for those who run them and those who live in them. First up, a rundown on the three most common barriers to adoption for administrators embarking on the journey to a smarter city. Many of our customers migrate workloads to HDInsight from on-premises due to its enterprise-grade capabilities and support for open source workloads such as Hive, Spark, Hadoop, Kafka, HBase, Phoenix, Storm, and R. This six-part guide takes you through the migration process and shows you not only how to move your Hadoop workloads to Azure HDInsight, but also shares best practices on how to optimize your architecture, infrastructure, storage, and more. This guide was written in collaboration with the Azure Customer Advisory team based on a wealth of experience from helping many customers with Hadoop migrations. 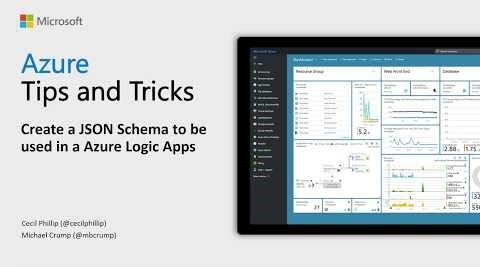 Learn how to create a JSON Schema that can be used in Azure Logic Apps. You will also learn a few tools that will help you generate sample JSON data to validate your JSON payloads. This episode Jeffrey brings you a live recording from the Microsoft Ignite event. Today, he’s talking with several people, including Greg Leonardo, Josh Gaverick, Rob Richardson, and Colin Dembovsky. Tune in to hear highlights from each of the guest’s panels, what they have enjoyed learning about at the conference, their insights on various topics in the Azure space, their day-to-day work and projects outside of the conference, and their predictions on the future of Azure! Earlier this year, Microsoft announced that we will invest $5 billion in IoT over the next four years. This year alone we announced many exciting additions to our IoT portfolio, including Azure Maps and Azure Digital Twins. This post announces strategic partnerships across both platforms and solutions built by Azure IoT partners to further help cities meet their ambitions of becoming Smarter Cities. The Azure Marketplace is the premier destination for all your software needs – certified and optimized to run on Azure. Find, try, purchase, and provision applications & services from hundreds of leading software providers. You can also connect with Gold and Silver Microsoft Cloud Competency partners to help your adoption of Azure. In the first half of October we published 31 new offers. 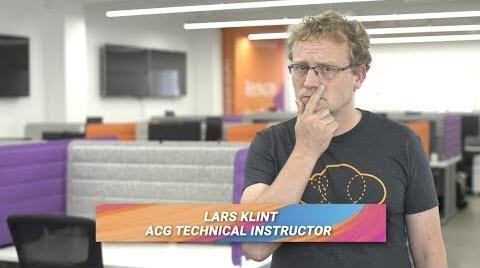 This time on Azure This Week, Lars talks about the public preview of live data local testing in Azure Stream Analytics, the availability of Azure SignalR Service, and Microsoft Ignite - The Tour.